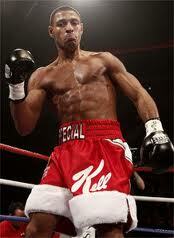 Kell Brook is one of the best boxing prospects in Britain. A welterweight with a 27-0-0 record, Brook has great speed and power, and he's showing a willingness to keep increasing his level of competition. We last saw him beat Matthew Hatton in March. This was a fight that did big business, selling 10000 tickets in the space of a month, but it was also a fight in which the promoters did a number on us. It was packaged to boxing fans as a 50-50 fight, the new kid Kell Brook vs the experienced Hatton brother, a fight that was a pick-em and could go either way. Deep down people must have known this wasn't the case, and that Brook was always the likely winner. We're hoping for him to take a big step up in his next fight, and it isn't long until we find out who it is against. Brook already has a date booked in for July 7th in Sheffield, but right now his opponent is TBA. The announcement is going to come this Thursday on the Sky Sports boxing channel Ringside. Tune into Ringside on Thursday evening to find out first-hand who Kell Brook will fight next. Alternatively you can visit our subscribe page and we'll send you updates. Let's hope he gets a good fight.